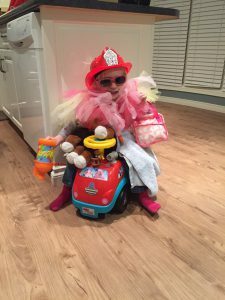 You love the idea of dress up play, you know dramatic play is important for children, but the dress up collection in your house is rarely touched. And you wonder, “why don’t my kids play dress up more often?” And you wish you knew how to get them do so! It’s a surprisingly common topic of concern, believe it or not! 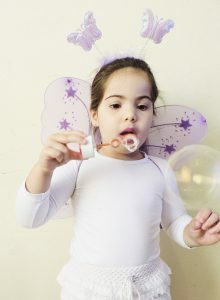 Let’s take a look today at some reasons why your kids may not gravitate towards dress up play – and in doing so, we’ll get some ideas for how to change that, and get them immersing themselves more often, and for longer periods of time, in the creative and fun world of dress up. 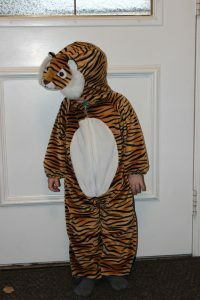 11 Reasons Why Your Kids May Not Want To Pay Dress Up. 1. The costumes and dress up accessories just aren’t… FUN. Ok, take an honest look at your dress up clothes collection that you’ve assembled for your child. And try to look at it from a kid’s perspective. Perhaps you’ve done a great job at collecting some fun character costumes, some creative accessories like capes, shoes, hats, gowns, jackets, and more… but perhaps it’s a motley, rather dismal set of thrown together items that doesn’t look all that appealing. Kids are visual and tactile beings, meaning, they are drawn to great looking and great feeling things (just like you, right?)! 2. The dress up clothes are ripped, stained, waaaaay too big, or waaaay too small. Spinning off my first point, if the dress up clothes are all really old… say, perhaps they were the dress up clothes of your own childhood, and in really rough shape by now (and smelling like mildew? ), it makes sense that kids won’t want to play with them much. Articles that are too small, or seriously, so big they can’t even tie them on just aren’t a lot of fun. Look through your dress up trunk and just toss into the garbage can (maybe even do this together with your children) the items they just won’t ever touch. 3. The kids can’t identify with the characters they would be acting out. What I mean by this point is that your 3 year old daughter just won’t understand a Pioneer costume yet as they have never been exposed to “the olden days” concept… but she’ll probably go nuts over a Everest PAW Patrol costume, a frilly princess gown or some cute butterfly wings in her favorite color! 4. The costumes are too hard to get off and on by themselves. 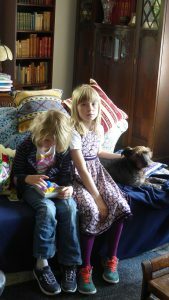 If you want your children to “go and play dress up” by themselves, you’ll have to understand that it can be very frustrating for them if they can’t get the clothes off and on when they want to, and have to keep running back and forth to you, up and down the stairs etc. Frequent costume changes are a HUGE part of dress up play, so make sure that the items in their dress up collection are easy for them to get off and on themselves. Think Velcro, pull over dresses, etc. 5. They have never really seen dress up play “in action” and thus really don’t know HOW to start playing it! To solve this problem, you can do a few things. 1) You can invite over some playmates you know who ARE into dress up and send the kids to the playroom together… they can learn from each other (this REALLY works well if you get the right “teacher”). 2) You can play with them yourself a few times. 3) You can read some of these books about dress up and talk frankly about how to play it. 4) You can suggest some of these dress up games to get them started! 6. They don’t want to play without you. Sigh… this is a tough one for me, personally. My kids always, always, always want me to play with them. (Which is both good and bad, right, fellow moms?) Anyhow, sometimes some tough love and firm “Mommy’s busy – you stay in here with these fun dress up clothes until the timer goes off in 20 mins, then you can come find me” is a good way to get it going. 7. The dress up clothes aren’t being displayed nicely, or are out of sight. If you display the dress up collection in an enticing way, like using one of these kids dress up storage units perhaps, they might be MUCH more interested in the cool stuff you’ve picked up for them! Out of sight, out of mind, remember? 9. The costumes they have don’t really interest them (ie., too many Princess gowns for a tom-boy who would rather dress up as a firefighter). See my article about “How To Pick Dress Up Clothes Little Girls Will Wear Over And Over“. You can’t FORCE a child to have fun with something that completely doesn’t interest them. Even if you REALLY want your son to be into Superheroes, you can’t make him enjoy running around in a cape if he’s more into animals or trains. So, play to what HE loves and you might find he actually DOES love playing dress up! 10. Developmentally, they haven’t learned yet how to pretend to interact as someone other than themselves. This is a very important point that you can’t pretend doesn’t exist. Little toddlers are incredibly egocentric, and it’s “all about them” at a young age. So to expect them to be right away able to role play or get in character with dress up is not really fair. 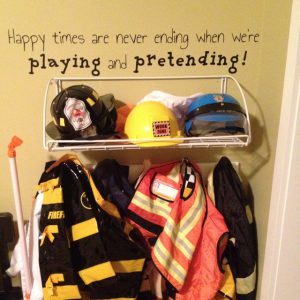 It WILL come – and dress up play helps that along really well – but at first, be happy with them doing frequent costume changes, and just dancing around having lots of laughs and silly fun, looking at themselves draped in all sorts of items and asking for pictures to be taken! 11. They think they look silly, not great. Some kids love looking and acting silly on occasion, some just do NOT. This one is a bit surprising, but it’s also true. And to force a child to act silly or wear something they feel VERY uncomfortable in is not going to help them socially, in fact, they’ll be embarrassed and to put it mildly, they won’t thank you for it. I’m sure you know your child well enough to know if he or she is simply a more serious character – if so, there’s nothing wrong with that – enjoy his or her unique talents in other ways! And you can also do other dress up activities, like this dress up sticker activity to help them understand the creative side of dress up play. So, my fellow Mom of toddlers, what do you think? If you have been trying to get YOUR kids to love dressing up and dramatic play, which of the reasons above is the biggest problem YOU face? Or have I missed one? I’d love to converse about it… please, drop me a comment below! Want to save this article for future reference? Pin THIS! Oh I adore dress up. As a teacher, I am always making my class do these things. I teach 3rd grade. Sadly, I am beginning to find they are too cool sometimes. This breaks my heart. But I know I dress up as characters in their story/ novels we are reading and the children laugh and have a great time. I agree, it is important for their creativity and just empathy for characters and soon people. Great stuff! Thanks for your reply! Unfortunately you’re right – the “too cool to play dress up” is another thing that stops some kids from enjoying this awesome role play world. I love your way of getting them into it again – through school activities! When the teacher does it, and then encourages THEM to do it too, they suddenly get “ok with it” when it’s “required”… and find themselves having a BLAST! I taught grade 5 for several years, and I would throw a big dress up Medieval Festival when I was teaching my Middle Ages unit. The kids (and I) always LOVED dressing up for that! Maybe it’s just creating the right setting where it’s “cool” to have a great costume… and they suddenly remember how fun it is to play act!